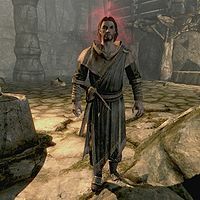 Moric Sidrey is a Breton Vigilant of Stendarr. He led a group of Vigilants in Ruunvald and kept a journal series on the excavation, and later became charmed by Minorne. After being charmed, he wrote a scripture about her, found in Ruunvald. He wears either novice robes of Restoration or of Alteration, a pair of leveled heavy boots, and a 50% chance of a pair of heavy gauntlets, both up to steel plate quality. He also wears an amulet of Stendarr and is equipped with a pickaxe. He carries a torch and two random books. This page was last modified on 19 January 2016, at 20:58.